The Milanese driving for team Ghinzani managed to keep behind Agostini and Maisano in the second race of Imola. In race three he repeated himself proceeding Nicholas Latifi at his first podium of the season and Sergey Sirotkin. 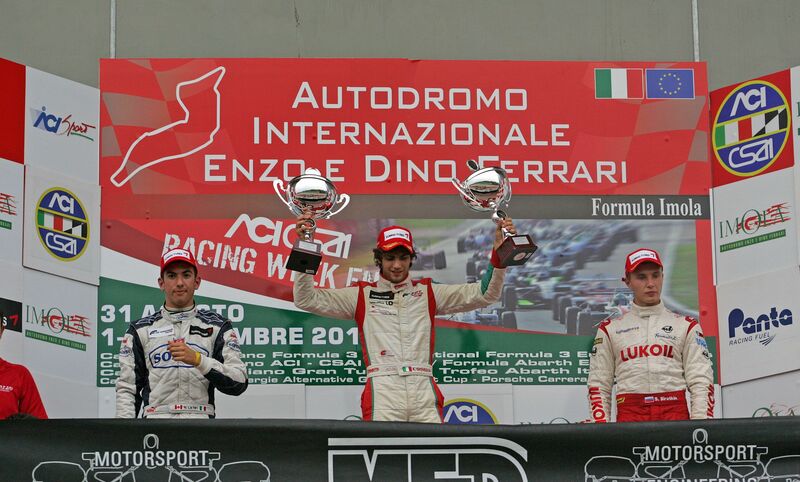 02/09/2012 - Kevin Giovesi awarded himself with the first success of the season at the Santerno’s circuit in the second race obtaining the second victory of team Ghinzani in the first season of the Italian Formula 3 European Series. Behind him, Riccardo Agostini, on the Mygale of JD Motorsport and Brandon Maisano (Prema Powerteam). That was not enough for the Milanese driver who also secured the victory in the sprint race scoring his first double victory ahead of the very good Nicholas Latifi (JD Motorsport) and Sergey Sirotkin (Euronova). In race 2 Kevin Giovesi managed to keep the lead of the race at the start overtaking Riccardo Agostini who started on pole. The Milanese did not concede his position from then on and crossed the finish line with a six tenths lead on the driver from Padova who has been excluded from the classification of race one yesterday after post-race verifications due to an irregularity on his car. Third at the flag was Brandon Maisano (Prema Powerteam) after the bad race one as he managed to avoid contacts with his team mate Eddie Cheever , with the latter finishing behind him. Sixth position for the third driver of Prema Powerteam, Henrique Martins who proceeded Nicholas Latifi and Sergey Sirotkin. Mario Marasca was only eighth, as the BVM driver had a troubled weekend in Imola. The ninth position went to Yoshitaka Kuroda. Problems at the start for Kuba Dalewski (Ghinzani) who had to start from the pits and after four laps ended his race on the gravel trap. Roman De Beer (Victoria World) had to give up to the bad luck after the failure of the exaust that forced him to retirement. In race 3 Dalewski was on pole position but at the end of the formation lap he got back into the pits leaving his spot empty. On his side was Roman De Beer, but Nicholas Latifi got the most out of the start from the inside line. The Canadian was followed by Giovesi and Sirotkin, but could not resist to the attack move by the Milanese driver that got the lead of the race. Giovesi awarded himself with a stunning double victory in Imola ahead of JD Motorsport’s driver who obtained his first podium in career. Third was Sergey Sirotkin who proceeeded Riccardo Agostini. Fifth under the chequered flag was Eddie Cheever, ahead of the South African Roman De Beer and Mario Marasca. Eighth was Yoshitaka Kuroda who ended his race ahead of the two Prema Powerteam drivers, Henrique Martins and Brandon Maisano.